The kitchen is the heartbeat of the home, but too often our kitchen counters can be messy and cluttered which can lead to us feeling stressed and overwhelmed. A clean kitchen is a happy and productive place to be! I shared last week about how I had completely cleared off my kitchen counters last summer, and the big difference that it made in my life. And if you follow me on Instagram you probably noticed that I spent most of a recent Friday sharing my process of clearing off my counters. I hope those posts inspired some of you to think about decluttering and completely clearing off your kitchen counters too! So today I want to walk you through how to completely clear off your kitchen counters! One issue that we need to tackle before we get started is the idea of leaving things out on our counters that we use regularly because it’s “convenient.” I first came across the alternative to this idea when reading about decluttering your kitchen on Becoming Minimalist. A lot of people leave things like toasters, coffee makers, other small appliances, cutting boards, knife blocks, cooking utensils and more out on their counters. I think there are two reasons for this. They feel like these are things they use regularly and think it’s easier and more convenient to leave them out on the counter. They don’t think they have room in their cupboards for these items. Let’s address #1 first, and then we can move on to #2. Here’s the thing about leaving these daily use items out on the counters – It’s really not as convenient as you think it is! Just for example – let’s say that you have 8 hours in your day at home (8 hours are spent sleeping and 8 hours are at work – if you’re a stay at home/work at home mama like me, you’ll spend even more hours of your day at home.) Out of those 8 hours, how much time are you actually using your toaster, or coffee maker, or cutting boards, or cooking utensils? 5 minutes? Maybe 10 or 15 minutes at the very most, right? So, if you use each of those items for 15 minutes of your day at the most, that leaves 7 hours and 45+ minutes that those items are sitting unused on your counter and taking up precious space – both physically and mentally because of the visual clutter they produce. Now let’s think about how much time you would spend to take those items out of your cupboard and then put them back away. It takes me about 5 seconds to pull my toaster out of the cabinet and plug it in. It takes me about 2 seconds to open the cabinet door and grab my cooking utensil out of the container. It takes me 10 seconds or less to put these items back into the cabinet – depending on if I wipe them off after using them, or if I’m taking them out of the dishwasher and putting them away. So, that’s about 15 seconds of time that it takes me to remove these items from the cupboard and then put them back again. All to be able to use the item for the same 5-15 minutes as when it sat out on the counter. Using 15-20 seconds of time to take something out of the cabinet and put it back again, and having the other 7 hours and 45 minutes of my day with a completely clear and free counter to use to do other things like baking and cooking? Or leaving that item sitting unused on the counter for 7 hours and 45 minutes, just so I don’t have to spend 15-20 seconds taking it out and putting it away? Try it for Two Weeks! Maybe you’re not convinced yet, I wasn’t sure at first either. So, I decided to just completely clear off my counters and leave them like that for two weeks. After the two weeks, I could put anything back onto the counter if I thought it was too inconvenient to get it out every time I wanted to use it. I want to encourage you to try the same thing. Completely clear your counters and leave them that way for two weeks. If you’re not convinced, pull your stuff back out and put it on your counter. But I think you’ll find, like I did, that it’s really not as inconvenient as you thought! And the benefit of having clear counters all day long is totally worth it! So, now that we’ve covered issue #1, let’s start working on the second reason people leave stuff out on the counters: they don’t know where else to put it. As I show you pictures of my cabinets in this post, this is real-life – my kitchen the way it really looks right now. My cabinets could use another round of decluttering and organizing. But the work that I did to make space for my small appliances and other things that used to sit out on the counter is still in place so that I can continue to keep my counters cleared off. Above is my pantry, on the top I keep small appliances like my bread machine, blender, immersion blender, and rice cooker. The bread machine used to sit out on the counter when I was using it at least once a week. We don’t use it often now, so it sits at the back of the cabinet. I’m planning to work on clearing out the food in my pantry to make more space to store summer produce so it doesn’t have to sit out on the counter. So, now you need to make space in your cupboards for the things that usually sit out on your counters. This is going to take some work, but as you can see, I have a fairly small kitchen and I was able to find a way to store all of my stuff in the cabinets (although I will admit that I have good cabinet space for the size of my kitchen). Clear out your cupboards of anything that you don’t use on a regular basis. Make room in the basement or some other storage area for these things. It’s a better use of your cabinet space to store your toaster or coffee maker that you use every day or several times a week in your cabinets, then to take up space with your Christmas dishes that you only use once or twice a year, right? This is also a great time to get rid of and let go of items that you truly don’t need or use. Again, what’s more important to keep in your kitchen – things that you use all the time, or things you haven’t used in 5 years? 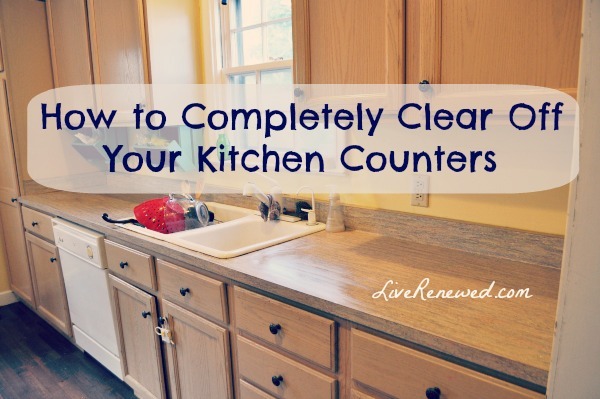 A clear counter is made possible by a decluttered kitchen. This step may take you some time the first time you tackle it. So leave yourself a good several hours one day, or work on this over the course of a week, as you work toward clearing off your counters. When I first did this, it took me working several hours each day over a whole weekend to get my counters completely clear. Most of us have an area of our counters where junk just collects from all around the house. This happened to me over the past few weeks. I had put the coffee maker back up in the cupboard, after having it out for a few months, and then the space where the coffee maker was became filled up with miscellaneous junk. My trick for junk on the counter in the kitchen is to grab a basket and put all of the junk that doesn’t belong in the kitchen into the basket. Then, viola! Your counter is cleared off and you will feel so much better! Then you can walk around the house with the basket and put things back in their appropriate places. I used this trick last week when I was clearing off my counters. I put everything in the “junk corner” into a basket, and then I just had a few more dishes to wash and my counter was completely clear! Of course, you need to make sure that you empty the basket and don’t just leave the stuff sitting in it – but once your counter is clear it will help to motivate you to get the rest of your stuff cleaned up too! Now that you’ve made space in your cabinets, the next step to clearing off your counters is to create “zones” in your cabinets for items that you usually use at the same time. You’ll have to figure out what this looks like for you, but in my cabinets I have a coffee zone, a baking zone, and a cooking zone. I keep like items together, and near the place where I usually use them. On the second shelf of this cabinet is my coffee zone. I keep our French Press, coffee, sweetener, vanilla, and Keurig coffee maker (yes it’s heavy, and I used to haul it out of the cabinet every day, but now we use a French Press to make our coffee). In my baking zone I keep my baking supplies, and this is also where I keep my toaster oven, because the counter below is were I use it most often. You’ll also notice my popcorn popper and knife block – which I’ll talk about a little bit later. The blue boxes hanging under the cabinets are produce storage boxes that my husband made for me after seeing a picture on Pinterest. They hold whatever fresh fruit or veggies I have on hand, to help keep them up and off the counters. In my cooking zone I keep my cooking utensils on one side of the stove, and my spices on the other. My utensils used to sit on the counter below the cabinet, but I cleared a space so I could keep them up inside the cabinet. It’s really no big deal to open up the cabinet and grab a spoon or spatula and it keeps that small counter space on the side of the stove clear so I can use it while I’m cooking. Creating zones in your kitchen helps to keep your cabinets organized, helps you to know where to store things, and helps you work more efficiently. My Kitchen Aid Mixer and food processor live in a cabinet above my fridge. You may have some other random stuff that you used to leave on the counter that you now need to find a place for. Make space in your cabinet, create off-the-counter kitchen storage, or somewhere else in the house if appropriate, and put it away. First, my husband made us these awesome kitchen storage boxes to help us keep our produce and other items up and off our counters. You can make these boxes yourself with this easy DIY Kitchen Storage Boxes tutorial! Our knife block doesn’t really need to go in a “zone”, but it does need to be near the place where I usually use it. I also found that putting our knife block up and away was an important safety measure. My kids stand on stools to help in the kitchen and have access to the counters, so it’s safer to have the knives to be up and out of the way! 5. Put everything away and reveal your new completely cleared off counter! How amazing does it feel?! I mean, I really think having a completely cleared off counter is a undervalued joy in life. It is amazing how much it changes the way I feel about my kitchen and my home in general, and how walking into my cleared out kitchen fills me with peace and gives me inspiration to make great and healthy food for my family and take better care of the rest of my house. It is such a great motivator! This was the first time I cleared of my counters. I got once side completely clear, but the other side was a disaster! I just had to keep working at it to get to the point that everything was cleared and put away! Are you ready to completely clear off your kitchen counters? Get my FREE checklist to walk you through the process! • It will get worse before it gets better. As you’re clearing out and decluttering your cabinets, your counters will get REALLY cluttered and full of stuff. But that is part of the process of removing the things you don’t really need from your cabinets in order to make room for the things that you do use on a regular basis. You will probably not be able to clear off your counters in an hour – unless you only have a few things sitting on them and your cabinets are already pretty clear and decluttered. It’s a process that can take several hours or even several days, depending on how much time you have to devote to it. • It will look different for each family and home. Only you can decide how much tolerance you have for keeping things out on your counter. Maybe you have a big kitchen with more space, so it’s worth it to you to leave things like the coffee maker or stand mixer out on the counter. Or maybe you have other reasons for leaving things out, and that’s totally fine too. The important thing is to make sure you are intentional about the things you leave out on your counter – you have weighed the pros and cons of leaving them out, and determined what works best for you and your family. 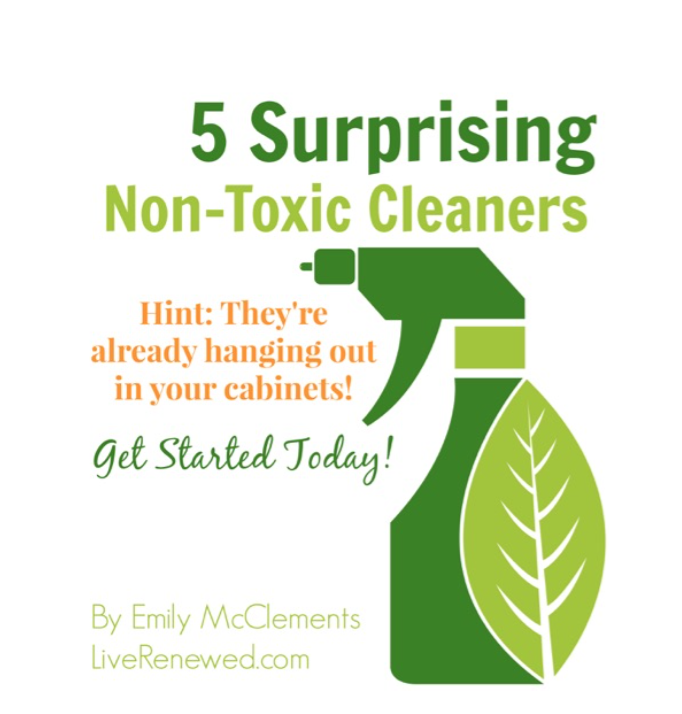 Will you join me in completely clearing off your kitchen counters this week? It will take some effort, but the results are SO worth it! 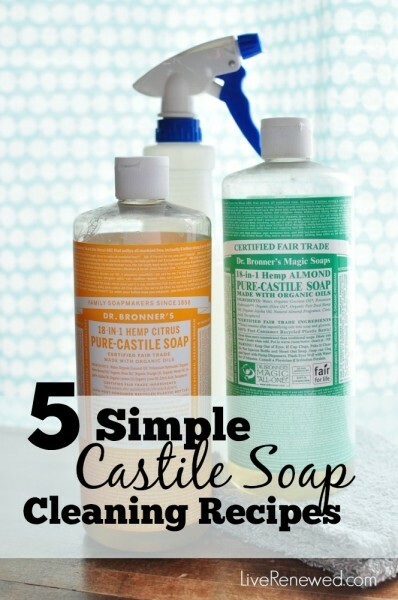 *Disclosure: This post contains affiliate links. If you make a purchase through one of these links I will receive a small commission at no extra cost to you. Thanks for your support of Live Renewed! I love the counters cleaned off! I do leave bigger things like my bread maker and kitchen aid on counter because they are heavy and I have deep corners on my countertop where they aren’t really in the way. I really like the idea of decluttered counters. Whilst reading this I cleared off 4 appliances! however I don’t know how practical some of it will be since I have older children who make their own toast, etc. I’m going to test it out anyway and continue clearing up the counters. Yes! I’m going to work on this tomorrow. We accumulate junk on our counter at lightening speed, so this may take some work, but I agree, getting rid of clutter makes me feel so good. Great post! I am concerned about knives store on upper shelves. Also heavy appliances. I agree that clear counters are pleasing but we must be practical. Hi, I love your post! I recently completely de-cluttered my kitchen. I do still have my toaster, coffee maker, knife block and produce on the counter. I can put away the knife block and toaster easily. My husband is home with the kids during the summer so I like having produce easily accessible and visible for healthy choices, but maybe I could use the pantry. My question is about the coffee maker…do you have any problems with leaving the wet appliance closed up and in a cabinet? I usually empty the grounds soak the pot and the basket in the sink for the next day and leave the reservoir lid up to evaporate the water. Thoughts/experience with that?? This post was truly inspiring! No joke, I was browsing pinterest for kitchen organization ideas, and when I saw this, I was awestruck! I can put my toaster oven in an upper cabinet?! I don’t have to keep my knife block on the counter?! I know these seem like silly little epiphanies, but these ideas just simply never occurred to me. As of last night, I am about halfway through reorganizing my cabinets and getting that countertop completely cleaned off, and it’s already looking and feeling so much better! Thanks for posting! What about a microwave? Do yousite that as well. Wedon’t have a lotof storage in our kitchen. I don’t know what appliances would even fit in our cabinets. Our microwave is built in above the stove. It was there when we bought the house. You can see it above in the pictures of my cooking zone. I do often have fresh flowers on my dining room table, which is right outside the kitchen. They do add so much color and beauty to my home – I’d encourage everyone to keep fresh flowers as often as they can! Reading this was seriously like a spiritual awakening! I’m not joking…. you gave a great step by step guide to this. I live in a constant battle with my kitchen counters and can’t wait to get starred on this project! Thank you! I think it is good to help people declutter and to really consider the things they use, but this seems a little manic to me. Why do you have the teapot out? But the coffee pot has to be put away? Where do you put your fresh fruit bowl? Isn’t it safer for the kids to make their own toast if the toaster is already out and plugged in? Or do I now have to do that task for them before they can make their toast? This feels like a perfectionist mindset. Just snapped pictures quickly – the teapot happened to be out, usually it’s away in the upper cupboard. Fresh fruit often sits in a bowl on the counter or the kitchen table where the kids have access to it. We use a toaster oven that is too big and takes up too much space to stay on the counter. So, this works for our family, Jamie! Thanks for your thoughts! People always said that I was OCD, because I keep most of my counters clear. I only have my knife block and a small metal basket with my oil and vinegar and salt and pepper grinder right next to the stove. It is not a manic mindset. There is something to be said to walk into a kitchen completely ready for whatever you want to tackle in it. I know exactly where everything is in my cabinets and without thinking walk to which ever cabinet or drawer any specific pot, appliance or utensil I need is in. Now I become manic when someone else fails to put anything back in its proper place. Call me it OCD OR MANIC, I’M happy when things are easy and efficiently done when working in my kitchen. I agree Jamie. I don’t see how spending time taking things out and putting them away saves me time? I’ve never had so much cabinet space that my appliances wuld fit in them either. I think it’s hypocritical to lecture about clean counters then have stuff piled up in your sink. I’d much rather have a clean uncluttered sink. A messy sink immediately makes the whole kitchen look cluttered. I had just finished washing dishes -they’re drying. 😉 Thanks for your thoughts Emelia! What mature and kind replies you have to those with less than positive comments. 🙂 Impressive. Thanks for the inspiration. Thanks for your concern – however keeping them up means that my kids can’t grab them and try to use the knives themselves. In our house, that’s more of a concern. It’s actually wise to keep your knives in the cupboard anyway – so someone/anyone can’t easily grab them to use as a weapon against you or someone else. But, you’re right, it’s not suitable for every family or home. Each family needs to figure out what works best for them! After being inspired by this article, I’m going to get rid of my knife block and use the knife board I have in one of the kitchen drawers. I’m short and don’t want to reach up for a block full of knives. Also it will make me get rid of the ones I have multiples of in the drawer. On my way to a pretty, organized kitchen! I have a breadbox on my counter. What should I do with it? Where would I store my bread? Hi Ketsia, I store my bread in the pantry cabinet. I’ve found that to work well for us! I am all for cleared-off kitchen counters. I have a very small kitchen (10×8) and only think you see on my counter is a paper towel roll and a tea pot on the stove. I don’t own a microwave or toaster (I believe microwave is bad for you anyways, and for a family of five small toaster is not practical, I can toast our bread slices in the oven if I want). I love minimalist modern clean look, mess and clutter distracts my focus and eventually depresses me. Thanks for sharing what works for your family Konul! Thanks Selena! Hope they are encouraging to you! There is decluttered, and there is absence of personality. The pictures of your kitchen make me feel kind of sad, honestly, and that is not coming at you in a mean tone. I cook everything from scratch because we eat a real food diet, meaning I cook three times a day. I keep my knives and utensils on the counters, I don’t use a microwave or toaster (we don’t eat bread) so I don’t have those, I use my HEAVY Kitchenaid daily so it lives on the counter (you are playing with fire by keeping that heavy mixer ABOVE YOUR HEAD unless you have a seven foot tall husband to take it down for you), and my coffee grinder and trusty, oft-used Vitamix also stay on the counter. I frankly don’t have the room to keep all that stuff in the cupboards, because that is where I keep FOOD and DISHES. I guess you just don’t keep the same amount of food in your kitchen we do…? Do you shop for food daily? Do you mostly eat frozen meals? Do you have a whole pantry room? Do you really leave all your bulk food in the thin, grocery store plastic bags? How the heck do you meal plan or cook efficiently like that? Yeah… No. I don’t see how anyone could feed their family a real food diet and still live a full life with a kitchen that is kept artificially blank like that. My husband would wonder if I was kicking him out or had sublet the house out from under us if he came home to a spec home demo kitchen like that. LOL! Hi Lisa, Thanks so much for sharing your thoughts. I can’t help but feel like you are making a lot of assumptions about me and my family. This is what works for us – what my family and I have decided is best for our home and our family. It may not work for you – and that’s totally fine. I’d bet you have found a way to keep your kitchen clean and running smoothly that works for you and your family, and that it also might not be the perfect way for everyone else to do it. That’s okay. The reality is that my kitchen rarely ever looks totally and completely clear like this because, yes, we do live here and cook here and eat here every day, hence the dishes in the sink that I had just washed. Kitchens get messy, that’s a good thing. But now I have the space I need to do the cooking I want to do for my family, and I know how to get my kitchen back to square one, if you will, because I’ve taken the time to figure out what works for me. I agree w/ Lisa, though I wholeheartedly thank you for posting this and giving me something to think about. Sounds like a good idea but I don’t think I have enough cupboard space. I am going to start looking, because my kitchen always look cluttered and I don’t like clutter. Defiantly going to start working on this process!!! Thanks for that, now I know how to. I’m feeling so empowered. In full control of my space. As it’s clearing my cluttered head at the same time. I’m 70 years fabulous and am only 4′ 3/4″ cute, so I just can’t pick up and replace my Kitchen-Maid mixer often! My friend calls it “the world’s heaviest kitchen appliance”! I do wish I had enough room in my little kitchen for different zones. I’m working on it though! Thanks for your suggestions. I was thinking that same thing. That mixer is one heavy beast. I can just see me crushing my firstborn with it trying to get it out of that cupboard. LG I LOVE that shelf idea- someday when I get to be a “real grown-up” again (joking) and have my own house I plan to put one of those in for my mixer. Right now it lives in a lower cabinet and rarely comes out because it’s so heavy and I have to move the island/cart we needed for more storage just to access it. I’ve just gone back to mixing some things by hand and not making anything that requires a lot of work until I get to a point where I can use it freely. Sadly, many of these ideas won’t work for us in this house because the cabinets are old and very small (cereal boxes don’t even fit in them). Plus, the homeowners opted to put the laundry room in the kitchen in leiu of a pantry, so- there’s that problem. My bread lives on the island cart in a basket. Ahhh, the downsides of renting. OK I didn’t think it was possible…but after reading your post. I’m doing it. I need to have that space free for me mentally. Cleared my counters today! Love it!!! Yes! That’s so great to hear Tarena! You have inspired me to clear my kitchen counter. Shelving is a good solution, eases accessability. I love this idea! I’m so on board! One question though…. what about a microwave? That would be a big thing to haul out and put back, and would take up mega space…. thoughts? I’m super interested! Our microwave is built in above the stove. It was there when we moved into this house. I’m glad it’s up there because I definitely would not have space for it on my counter! My in-laws recently remodeled their kitchen and added a microwave above the stove, maybe that’s a possibility for you? I keep my kitchen counters clutter free and I totally agree with what you say, I love it. I would like to email this to my siblings and friends. How can I do that. This is so inspiring to me. I really need to do this! This is a great idea, and I suffer from visual clutter everyhwere in my home. What can I do about having very narrow and short shelves in most of my cupboards?? Must do some major rethinking of where things are in my kitchen. I really need to do this, I must find a way. Hi Michelle, I realize that not everyone’s kitchens are set up to be able to do this, but I hope you’ll find some inspiration to think outside of the box and find a way to keep your kitchen clean and uncluttered that works for you and your family! Thanks for understanding the message of the post Maggie! Clean dishes are drying in the sink in that picture. And the kitchen actually rarely looks just like this – we live and cook and eat here every day! 😉 Had to snap a quick picture when I had the chance! Exactly! It’s really all suggestions; we must each do what works for our situation. I personally like having some things on the counters, bright colored spray bottle, air plant in cute container, unusual measuring cup. But I take ideas from lots of sources. You’re right Laurie! Clean dishes are drying in the sink! 😉 And thanks for understanding the spirit of this post – I hope everyone can find a way to keep their kitchen clean and running smoothly that works for them and their family! I could see myself attacking my pantry and cupboards with the same type of minimalism I’m doing with my cookware and countertops. Why do I believe I need a ton of variety in my diet when I keep cooking and eating pretty much the same things. I buy lots of rice and beans of different varieties and types and when I get it home, I use maybe a small portion of them and then they sit in the back of the cabinet in jars and bags not used again because I forget about them. I don’t think it would kill me to keep the two rices I eat the most (long grain and Basmati brown) and give away the rest. Same with beans. I use my pressure cooker/slow cooker to cook beans but it’s always black, pinto, kidney, and split peas. Yet I counted three bags of heirloom beans and about five bags of different kinds of beans in my pantry. I would love to get to a point of minimalism not only with my counters and my cookware but with my food. I’m already plant-based so it’s a good ecological kind of diet, I just need to stop so much food coming in! Love the idea. Just wondering what is in the teal holder on your wall? I was trying to make out what it was……fruit holder? 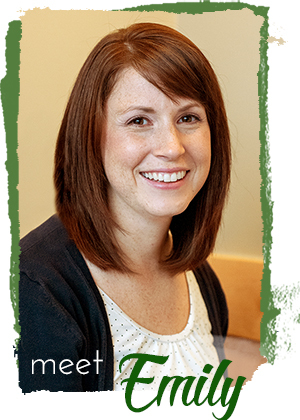 Hi Jessica – Yep! They are produce storage bins. What they hold depends on the season and what I have on hand – right now there are apples and bananas in one, and the other is filled with onions from my CSA this fall. It’s nice to be able to keep that stuff up and off the counters! Thanks for sharing what work for you. (I’ll never understand why people must fuss about that!) I loved when I cleared our counters in our house, but I didn’t feel like we could manage this in our RV (with three kids!). But now you have me rethinking. Our counters are so small, it would be extremely helpful (and less visually stressful!) to clear them. I think I can do this! Thanks for the inspiration. I read your article, gasped at the pictures, (shouted at some of the other comments – “She’s just about to clear up the sink too !!! !”) Decided I couldn’t possibly do this, then actually tried some of it. I’m not at the minimalist stage yet. BUT I’ve got rid of 5 wooden spoons, 2 spatulas, and 2 large storage pots (for the spoons etc) my small appliances don’t live on the surfaces, but I get the point. Sounds like you’re off to a great start Kirsty! While our kitchen isn’t big enough to have everything up of the counters, we do commit to keeping our island clean. The sink and Dishwasher are on the island and having nothing else let’s me have that feeling of relief when i see it since it is open to our dining and living room! Great suggestions In the article! I find it fascinating that some people find clutter distracting, especially to the point of leaving nothing out on the countertop. I chuckled when I saw the knife block in the cupboard. I had roommate that insisted the electric can opener be put in the cupboard. It was aggravating to keep finding it stashed in the cupboard. I had to put my foot down. I’ll admit that my counters are oftentimes too cluttered. I can use your tips to help with that, but I’ll never get to the point of leaving nothing out. Having the toaster out taking space I don’t need access to for something else costs me nothing. I have to say, how dare someone leave clean dishes to dry, and probably a hot tea pot on the stove to cool. Seriously people, get a grip. If you don’t like what she has to say, move on to the next article. I think you had some great ideas. I just decluttered my kitchen after reading this post. I didn’t shoot to remove everything, as to me that wouldn’t work, but I cleared 95%. I left out my knives and my espresso machine. The knives I just wanted out, so I moved them to a smaller counter, hidden a bit and my espresso machine is a beast and is used numerous times a day. I also left my 3 sugar, flour and flaxseed canisters as I just like these out and my tea pot. So I chose not to criticize the writer for what she decides would work for her and just took her tips and modified for my family. I’m super excited! My kitchen looks huge and I can enjoy the beautiful granite we just put in this year. I liked the article. I’m curious: what are the blue hanging baskets under one or two of your counters? I have VERY limited cupboard space, and those look like they might add a little extra space while helping to keep my countertops free. Also, my wall oven broke (it was 32 years old), so now we use an oversized toaster oven for all of our baking. Any thoughts on how to get it off my counter without my having to drag it out of a cupboard several times a day? I might try getting a microwave cart to put it on if I can find an out-of-the-way place for it. Thanks! Wonderful! Looking forward to it! Just wanted to let you know that we got the post up with the DIY tutorial for our Kitchen Storage Boxes! I hope it helps you get your counters cleared off! Hi, I just wanted to say I really appreciated this article and I think it’s a shame that people are so rude in their comments after you freely give your time and thoughts to write for the benefit of others. So thank you for sharing! I have been clearing my counters for about a year now, and I really love it. It’s true, it takes me less than 10 seconds to get my vitamix out, but the mental space it saves me is priceless. I don’t do well with visual clutter, and some people kitchens make me want to not even be in the room let alone cook, with all the visual distraction. I have a very small kitchen, and counter space is a premium. I have a fruit bowl, and I do keep a pretty jar of my kitchen utensils and that’s it. Thank you Erica! I’m glad you’ve found what works for you! Thank you so much for the article on decluttering your counter tops. While taking a break from all the cooking for family on Christmas Eve, I sat down to take a break and started reading this post. Boy did it encourage me. I jumped up and declutered my in a snap and it looked wonderful!!! I had tools used a few weeks ago in the corner of the counter top and coffee pot out that I only use when company comes over. (Last time used 2 months ago). I had cds on the counter top, platters used for Thanksgiving, bowls used for cooking stacked up and a lot of other junk on the counter top. It looked wonderful just in time for family to come celebrate Christmas Eve. Thank you so much for the encouragement. Merry Christmas! Good ideas. Not all applicable to me but I’ll go half way. I’m a very visual person and if I don’t see it I forget it. What do you recommend for fruit and bread knowing that it goes moldy and rotten when I put it in my cupboards? Family of 6. Decent size kitchen with adequate counter space. I for one will fully admit I’m OCD and neurotic in many ways there is nothing wrong with it and those who think there is are either neurotic and in denial or don’t know what they are missing! I have been avoiding my kitchen for a while now as far as organization goes, I NEED to get it done. Every system I’ve tried has failed thus far and I redo my kitchen organization about once a month. I hate cluttered counters but I don’t know where to stick anything else. I do have a large bakers rack I keep my microwave and lesser used appliances on (one more month and I get to donate the fajita maker of hubs he NEVER uses!!!) I also put in wood shelves (like a book case) for things like my crock pot, cast iron cookware, canisters, can opener, and canning pots. We live in a double wide and there is nowhere else to store those items except my shed and I do use them quite often so that is not a solution. What I need is a wall mount pan rack (I have 2 sets of pots n pans I use regularly) to free up lots of cupboards. I also need to redo the small pantry cupboard and reinforce the shelves in it (they were bowed when we moved in). haha, I totally agree with you! Thanks for sharing what works for you, Amberlyn. I use the counter space by my stovetop when I’m cooking – I’m always prepping ingredients or something that I need that counter space for! If it we’re me, I would buy a new dish drainer that would fit in my sink. We wash and rinse on one side, and dry on the other. That’s what we’ve found to work best for us! Hope that helps! I took your challenge and I must say it is the most peaceful and relaxing thing that I have ever done. THANK YOU FOR POSTING THIS CHALLENGE, YOU HAVE CHANGED MY LIFE!!!! I’m sorry but your cabinets give my anxiety! They look so cluttered and anything but organized. Your kitchen is MUCH larger than mine and with all that fabulous counter space, my pretty purple appliances (that I use more than once a day) would look gorgeous! wow I that never entered my mind about the time appliances are within sight all those hours! Can’t wait to get to this project. My mom always kept most everything in cupboards but I have struggled all my life with this~~ thank you so much!! And other folks, what’s wrong with you??? Can’t you be encouraging? Adapt the info to your situation and be an encourager! There are enough people in the world who criticize others. If she leaves her dishes in the sink, it’s her kitchen! She is kind enough to share with others what works for her. It was a new idea for me too Janice! I’m excited for you to get your counters clear! And thank you so much for your kind words, that means a lot to me! Sounds like you did a great job Vicki! Keep up the good work!! After reading your article I decided to try and see what I could give up off my counters. I found I didn’t need seven pair of scissors in a container on the counter. Along with three manual can openers, I’ve moved some stuff around and set some items free (donated to thrift store) My cabinets are so clean and clear. When my husband came home he asked if we were moving. LOL. Thanks for the inspiration. I too was floored at how many pairs of scissors and kitchen shears were in my kitchen. I found about six pairs of scissors and three kitchen shears. I am keeping the all-stainless shears I bought in Germany about ten years ago, moved one pair of scissors to my home office and one to the “junk drawer” in the kitchen (which is now practically clutter-free), and donating the rest. I’m hoping that by decluttering and owning fewer or only one of everything that I will be more “conscious” and keep them in their proper places! Great ideas, I think I am inspired to do some clearing off of counters. Did your hubby end up doing a tutorial for the under counter boxes? I know I need to de clutter my counters – but I can’t imagine having the cabinets space – and I have a large kitchen! But I don’t want my kitchen lacking personality…I bought a kitchenaid mixer mostly because I love the way it looks! My bread box is a beautiful antique…my fruit bowl is a gorgeous metal strainer and I would think having my Keurig put in a cabinet would led to water damage. I love this idea! I have already started, but I have run into a road block. I have a smaller kitchen and one tall cabinet I have is used for kitchen storage AND as a pantry. The cabinets are deep, but that just means a lot gets stuck at the back out of sight (until now). How can I efficiently use the small space we have without getting stuff stuck at the back? Also, where do you keep or suggest keeping recipe books and boxes? I use them on a regular basis so climbing up to get them out of the over the fridge cabinet is getting old. Any ideas? I have a tiny kitchen with some super deep corner cabinets. I use baskets to corral similar items, and make it easy to move a “front” basket out of the way access a farther back basket. I don’t use recipe books/boxes anymore (gotta love the internet) except for a 3 ring binder of frequently used recipes, which does live on my counter), but in one house we lived in someone had put a shelf over the basement door (which was in the kitchen) and that was perfect for cookbooks, and I liked how it looked), still high, but might be easier to access than the over-the-fridge cabinet? Thank you so much for the inspiration, Emily! As I was reading the article I got up to work on my counter tops. I’ve been working on them on and off for awhile, so they weren’t very cluttered, however I am going to take the 2 week challenge. I feel such peace when I see open spaces, so I believe I’ll really enjoy this. This is awesome! We’ll be featuring it in our Home Selling blog series this week as we help Chicago’s NW suburbs’ home sellers prepare their kitchens for showings. Feel free to drop in and say hi. Hah! It’s a good thing a lot have already asked about the microwave. It’s not like a coffee maker or blender that can be easily tucked away in a cabinet and take it out when needed. Your idea is good. I might give it a try. Every time I look at our kitchen counter top, I feel like I’m getting a headache. I must try this one. Hi, I just found this. Since I find the “plugging in” the most annoying part of using an appliance, I think the daily stuff can live where it causes the least frustration. I do have appliances that are stored on bookshelves in the next room. Plus, since I clean mid-morning and things get messed up during the evening, the coffee pot would probably lose its place at inconvenient times. I’ll look into “appliance garages” for my next house. Looking at your cupboards made me long for a previous kitchen with 42″ wall cabinets! Since then, I’ve downsized drastically and live on a small trailer in the mountains. It was eye-opening to see what items I simply didn’t need. I, too, find clutter distracting and utterly depressing. Since I have limited space I’m my kitchen, I do keep a few things out – an old crock with long-handled utensils (just those that made the downsizing cut), Kitchenaid mixer (too heavy for me to lift), and microwave oven. I have paper towels mounted on a door under the sink, no longer use a knife block, and keep flour and sugar stacked in cupboards, not in cannisters on the counter. This has evolved over many years. I add character to my kitchen by displaying some favorite antiques(that I still use), and favorite framed prints. I don’t clutter my walls with stuff, either, for the same reason I like to keep.the counter cleared. Our kitchen table is an antique, porcelain-topped table with two leaves that pull out. I just love its versatility! It’s large enough to seat six, can handle hot pans from oven or stove, and makes a perfect surface for large-scale baking. I think it’s indepensible? I’ve downsized my china, donated crystal, and auctioned off items I no longer need. I am hoping to downsize my everyday Noritake china since it no longer makes sense to keep place settings for 12. However, I cannot bring myself to selling my grandmother:s antique china or the small collection of antique etched crystal stemware I’ve discovered over the years. Just love it! Thank you for letting us take a peek at your home and for sharing some wonderful suggestions. I cleared off my countertops and wow what a difference. Once you do it, it’s like you don’t want to go back to the “way” it was before. Like the other commenters, I found my cabinets were filled with foods and appliances and tools I haven’t been using. I put together a box of canned and packaged food to take to Whole Foods (they take food donations for charity), and a box of kitchen tools and equipment for Goodwill that I’m not using anymore. I haven’t used my huge Cuisinart food processor in about a year (!) so I’m giving it six more months, and if I don’t use it in that time, I’m donating it and buying an immersion blender with accessories (Dualit or Cuisinart), which will take up much less room. I’m clearing out cabinets to make room for the stuff that actually STAYED on the countertop, like my electric tea kettle, cutting board, and stash of tea/cocoa. Even more, this post motivated me to start clearing out and organizing spices and other foods. I enjoyed your article very much. Thank you for posting it. Emily, I really enjoyed your post!. The step by step inspiration/guide really helps break down the overwhelming, organizational jobs into ‘do-able’ tasks. I will definitely read this again and hope to tackle my kitchen soon! I can’t help but comment about some of the comments I read. As I was reading through them, I was appalled! I can’t help but feel as though the people who are making negative comments have miserable lives, with nothing better to do. Thankfully we live in a free country, and can decide what and when we CHOOSE to take part in something or not. I appreciate all your thoughts, time and dedication that you, and all of the amazing bloggers out there, put into your blogs, to help INSPIRE others!. Great job! BTW, I am new to your blog and can’t wait to browse around!? I cleared my canisters (which are really attractive. I thought I’d miss but I don’t), a decorative candle, my dish soap (I had it in a decorative dispenser, but it still was eye clutter. ), and my NutriBullet. I have a big kitchen. I still have my microwave, Keurig, and Bread basket pushed out of the way in one area. I’m considering giving up coffee (for other reasons) and if so, I will get rid of Keurig. I also have my Toaster Oven which I use multiple times per day. I like it though – it is stainless steel and looks good with my appliances. I wouldn’t want completely clean countertops, I have created a balance of what works for my family. Just a personal opinion, the produce boxes are bulky and rustic compared to the rest of your kitchen. Painting them that bright color really draws in the eye and creates a lot of visual clutter. If you painted them the same color as your wall color, it would be so much “cleaner” looking. If you wanting a “pop of color”, you could add a pretty valance or roman shade above your kitchen window for a much more attractive pop of color and add some personality. This is really speaking to me now. I have turned a closet by my kitchen into a pantry of sorts since I don’t have one (using shoe & sweater organizers). I am making an ‘over the door’ shutter to hang kitchen tools on. I have also used dollar tree over the door holders to hang a few Ikea baskets…they hold my oils and vinegars. I have some other ideas to help me out, but thank you for really breaking some of this down for me. Sometimes I get too involved in the minutia to see the big picture. I love having my counters cleared. All I have is my coffee pot out. It’s great. I created hidden shelves. In my kitchen in the washer/dryer section. It’s true it doesn’t take hardly anytime o take out an appliance. I keep my utensils in a jar in the bottom cabinet. I don’t know if I would like to take out my toaster oven at times. I was fortunate enough to put in alone on a hidden shelf. All I do is take out the washer plug and put the toaster oven on. I don’t like clutter but can’t image taking my coffee pot off counter. This was so awesome! I found it on Pinterest, pinned it and told hubby we MUST do it. After years upon years of kitchen clutter it was driving me nuts and yes, stressing me out just looking at it. We took a weekend and cleaned out all the kitchen drawers and cabinets and got rid of ALL the clutter on the kitchen countertops. The toaster and coffee pot (both of which we only use on weekends) are now stored away in a cabinet and aside from one plant there is NOTHING on our countertops. Yes, it was a big commitment and took quite a bit of work but it was totally 100% worth it. We both love how tidy it looks and it’s so easy to keep it this way. We decided to go two full weeks with nothing on the counters and then decide what we felt needed to come back. Well, half way thru those two weeks and we’ve yet to find anything so far that we feel needs to again reside on the countertop. Thanks so much for a great post – complete inspiration! I love this idea. It will take a bit of rethinking for me. I keep a lot of stuff down as I have thoracic outlet syndrome (like carpal tunnel syndrome but in the shoulders. If I lift anything above shoulder height I’m likely to drop it. It drives me crazy having everything down. I’m trying to figure out a way to organize so all my frequent use things are below the counters. Anyone else have a similar situation care to share what their kitchen cupboards look like? I will be honest and say I flipped out at some of the things Emily said. But brought it back in to perspective by reminding myself that what works for some will not work for others. Sorry Emily….I think the thing I flipped the most on was putting that KitchenAid mixer in the cabinet above the refrigerator. Mine has always lived on my counter and now that I have my Mom’s (who is not longer with us) KitchenAid mixer, it has a place of honor on the counter. Besides they are horribly heavy. Yes, I have counter clutter and hate it. I keep going through and reorganizing, eliminating, etc. I have a large pantry closet (30″ deep x 5′ wide) that I need to do something with first. It has the wire shelves which are extremely deep. My biggest complaint is that they bow from the weight. I would rather have wood shelves with hinged shelves that can be opened to give access to the “back” shelves so things don’t get lost. I’ve actually had a couple of explosions from canned goods that got lost (pineapple is the worst on this!). I built rolling shelves to put my pasta containers on in the pantry so I could roll them out to get behind them. The problem with that idea is that they don’t roll good on the ceramic tile floor but also they tip too easy due to being tall and not deep so hinging them would work better. The produce bins your hubby made would be great in my pantry closet. For those asking what to do with their microwaves, if you cannot remodel your kitchen but have a freestanding stove, go online and buy a microwave shelf that fits on top of the free standing stove. It will take microwaves or toaster ovens. It is metal lined on the bottom of the shelf to protect (and clean easy) from the steam and spatters of what is cooking on the stovetop. They cost about $100 but I had one in my first house to get the microwave off the counter and I recently bought one for my dad’s house to get his microwave off the counter as he doesn’t have a lot of counter space. His cabinets would allow us to put in an over the stove microwave but since he had just bought the microwave we went with that solution. In the unplanned kitchen remodel (burst pipe flood), I allowed for putting one over the stove in the future. I did expand the layout to add counter space but was limited in options due to windows and layout of kitchen walls/space.